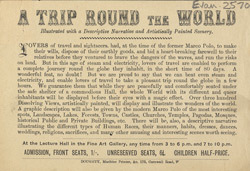 This leaflet is advertising a lecture and slide show in the lecture room of the Fine Art Gallery. Technology developed at an amazing speed during the 19th century, and for those that could afford to, watching slide shows was an amazing experience. Moving film had not been seen yet and slide shows using projectors like Magic Lanterns were the most modern of technology, they presented exciting and brightly coloured representations of the world. Visiting foreign countries, and going on a Grand Tour of Europe was a way of educating oneself with new cultures. If you could not afford to go on a Grand Tour yourself, watching a slide show like this one, was an amazing substitution.